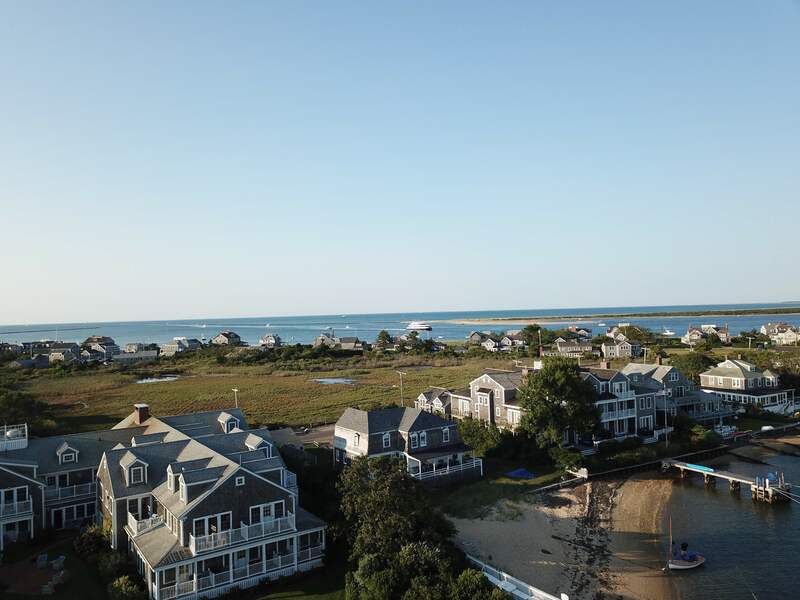 Nantucket is a place I always wanted to go to, but for some reason never thought it would happen. To me it seemed like a dreamy destination, but I always thought of it as a distant island off the East coast that I wasn’t even sure how to get to! 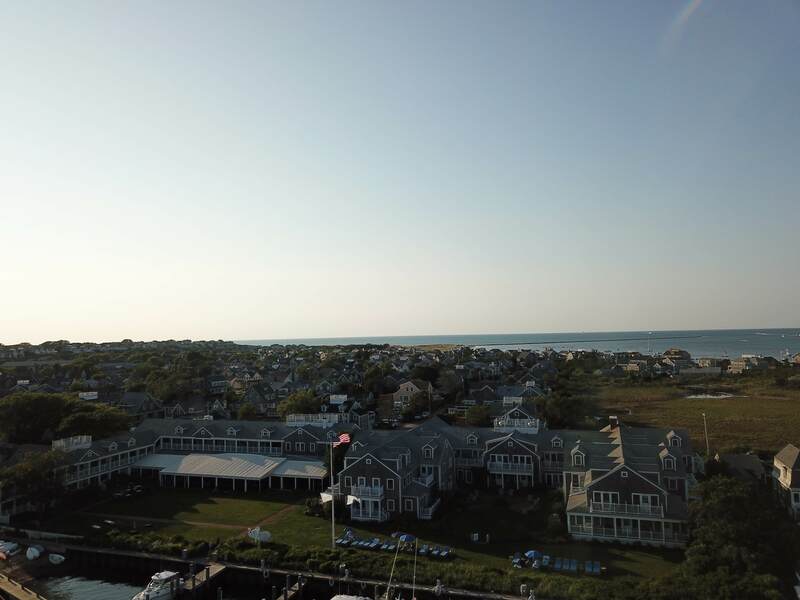 It turns out that not only was Nantucket as dreamy as I hoped, but it was incredibly easy to travel to! 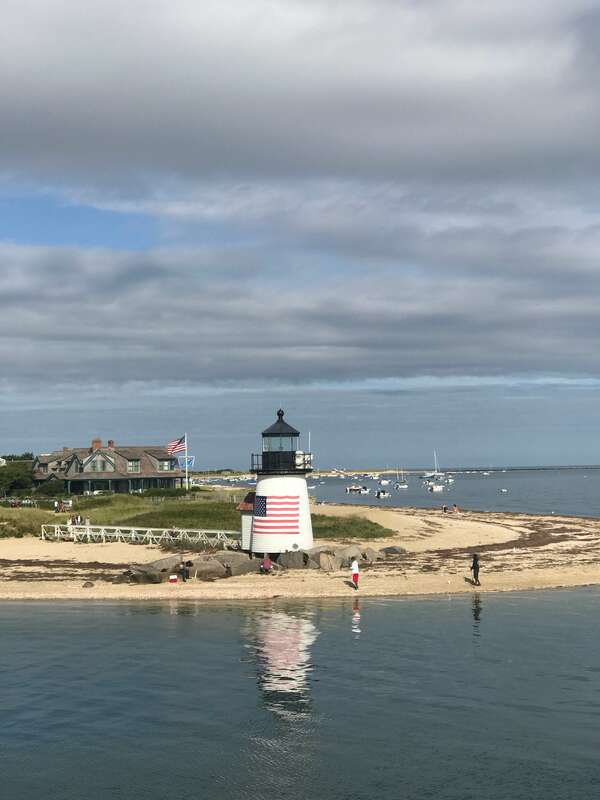 We went on an incredible road trip to Cape Cod, Nantucket and and Martha’s Vineyard, and I think I loved Nantucket the most. The first thing I did was book our hotel using Booking.com. 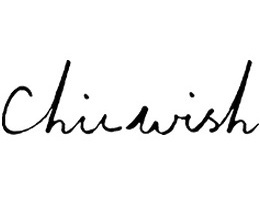 They have an app that is so easy to use, and I loved reading all of the traveller reviews! There were so many options to choose from, and there were lots of photos of the hotels along with a list of the amenities which made our decision that much easier. 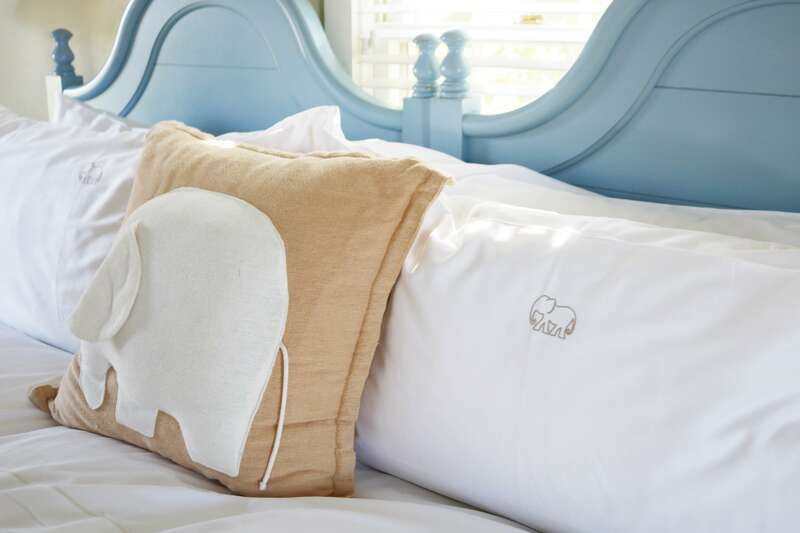 To save $40 off your next booking with Booking.com click here! I had never been to Massachusetts before, and driving was very easy – it only took about 9.5 hours, and it was really easy to navigate there. 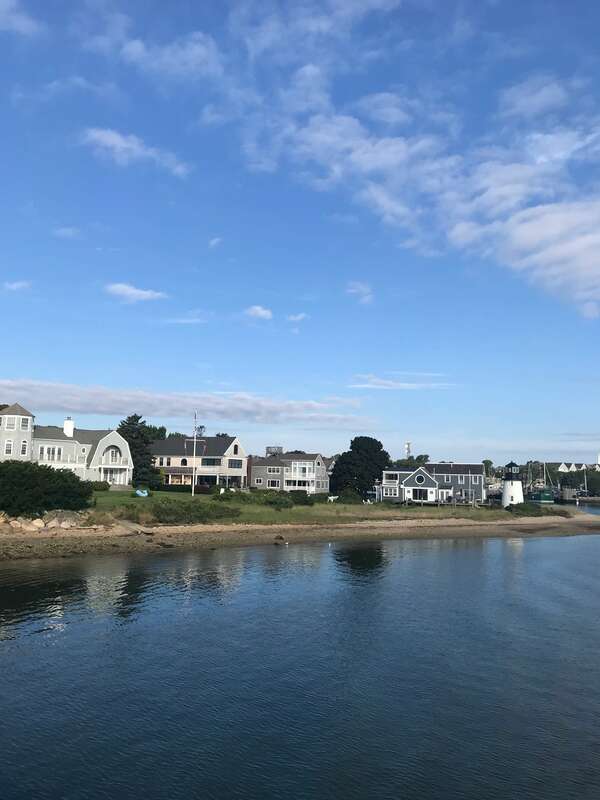 We took a ferry from Cape Cod on Hy-Line Cruises, and there was an option for the car ferry (two hours) or the high-speed ferry which we chose and only took an hour! The ferry had a snack bar, and indoor and outdoor seating. 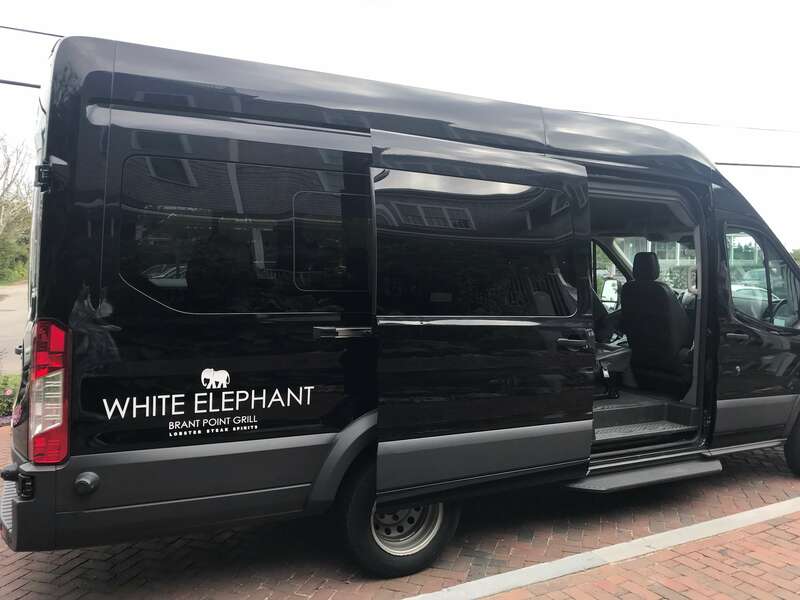 Our hotel in Nantucket was the White Elephant Hotel, and they offered free pick up and drop off to the hotel from the ferry dock. I emailed the hotel in advance to arrange our pick up and they were there when we arrived to help us with our bags and to take us on the short drive to our hotel. 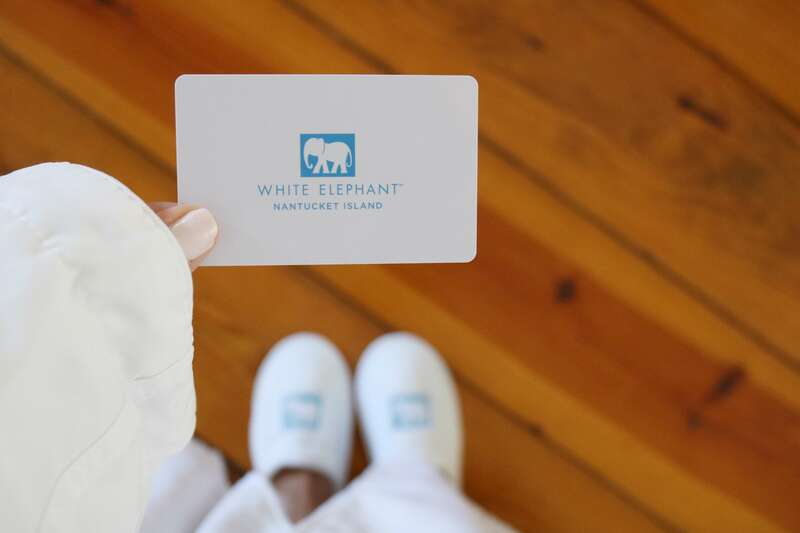 There are actually two different White Elephant Hotels in Nantucket – the White Elephant Hotel and White Elephant Village. 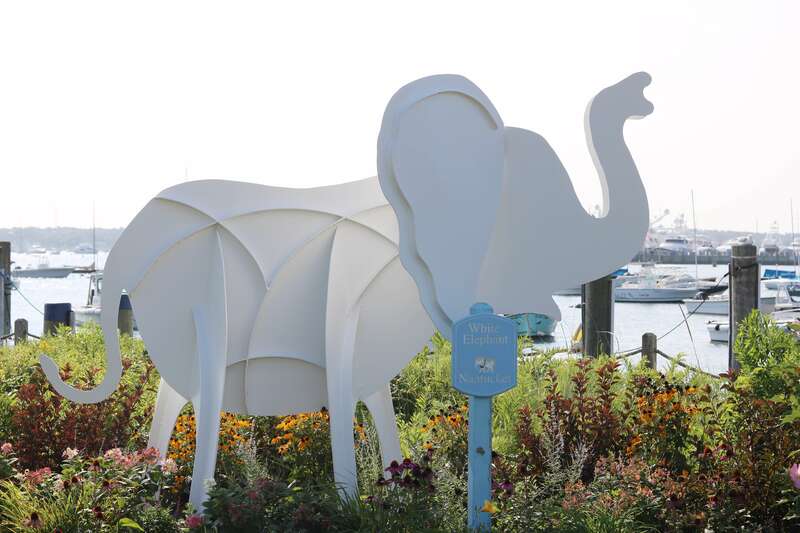 We stayed at the White Elephant on the ocean, while the White Elephant Village has a pool. 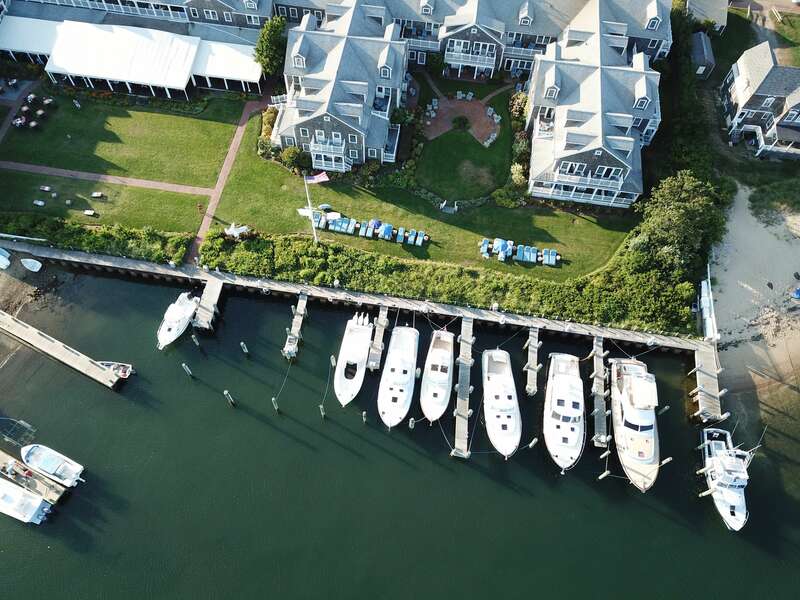 They also have other sister properties on the island as well which you can take a look at on their website (the over-water cabins on the docks seemed really cool!). 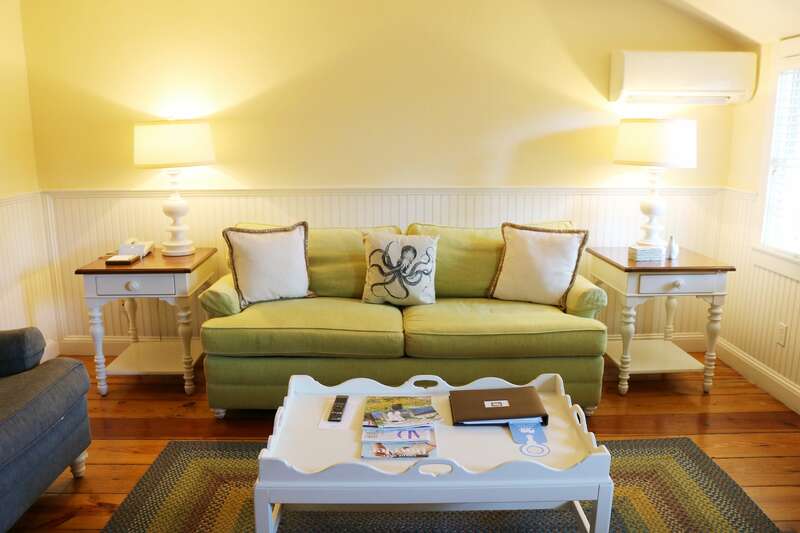 We stayed in a cottage called Holly, and it had one full bedroom, along with a bathroom that linked to the living area which had a pull out couch for our son. This much space was important for our family since we love being able to put our son to bed, and then we can stay up a little later ourselves watching a movie! 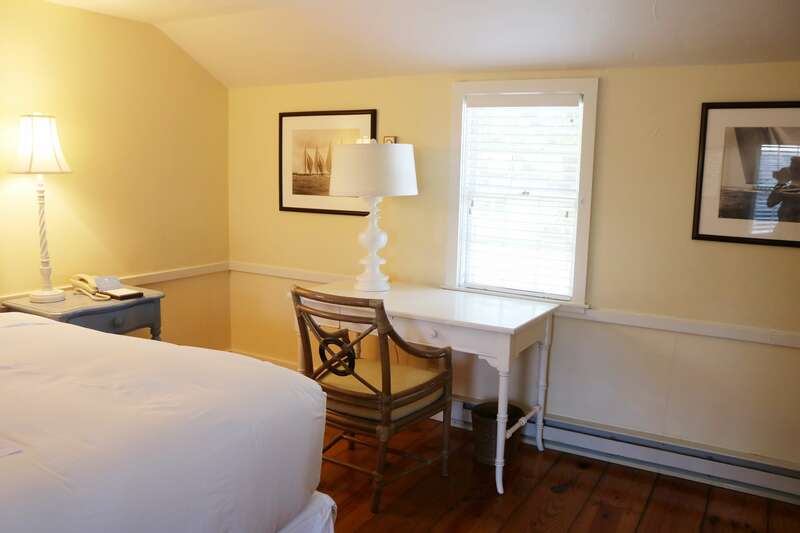 The room was beautiful, and it also included two TV’s, a fridge, and just outside our cottage was an area with lounge chairs in the garden. 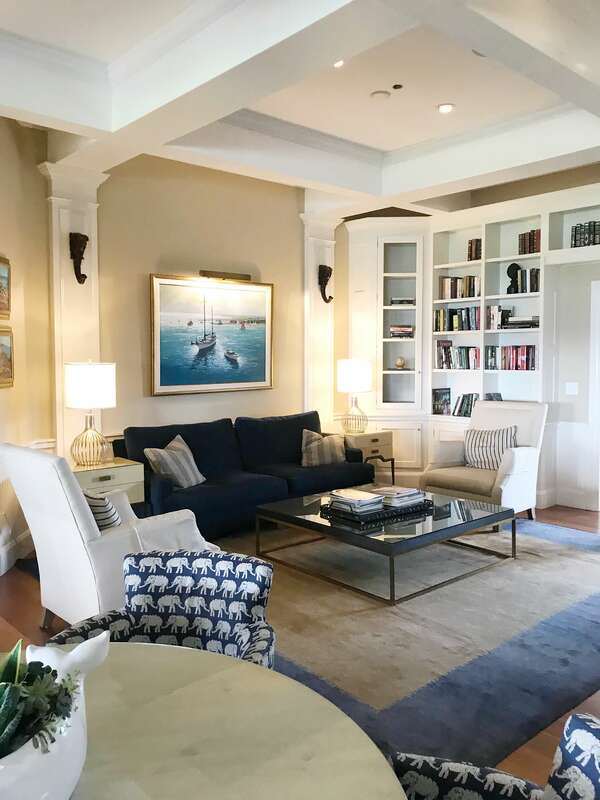 The cottage was a short walk from the main building of the hotel which included the lobby, the library, the spa, the gym, and the restaurant – Brant Point Grill. The lawn was sprawling and seemed to be the heart of the resort where you could play lawn games, or hang out on the lounge chairs watching the boats come in. The lawn faces a dock where you could arrange a charter, and there was also a path to the Children’s Beach next door. The Children’s Beach had a great playground and view of the harbour. 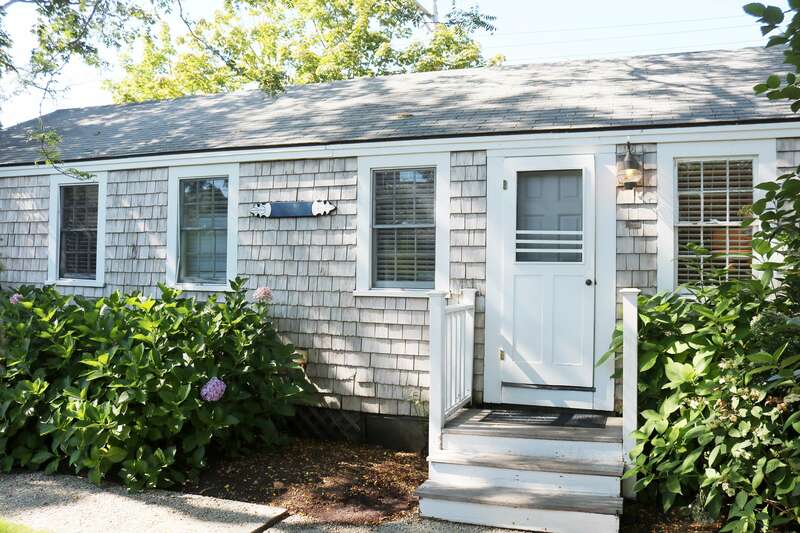 The Brant Point Grill faced the lawn as well where you could have breakfast, lunch or dinner either inside or outside. 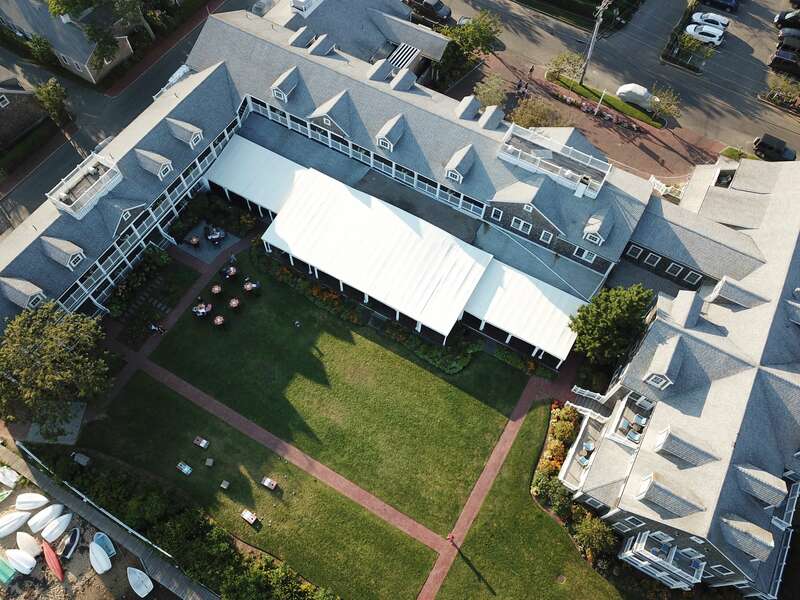 Not only did the hotel have the quintessential Nantucket feel, but it had a luxurious feel – fresh flowers in the lobby, cucumber water and rosé for guests near the front desk, there were plenty of staff available to open doors for you and to answer any of your questions, and every inch of the grounds and the hotel were spotless. 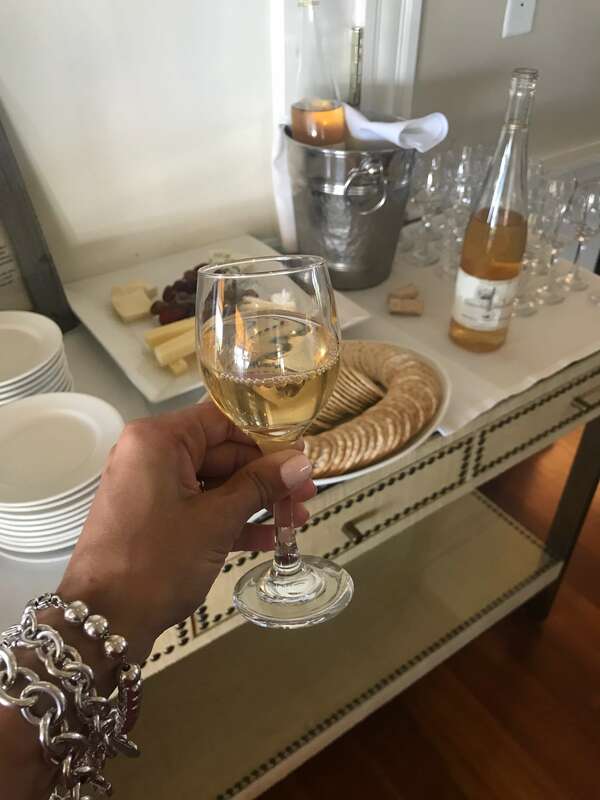 Between 4pm and 5pm each day they served complimentary wine and cheese in the library, and in the morning there was complimentary fresh coffee and pastries in the restaurant for guests. What else was included? 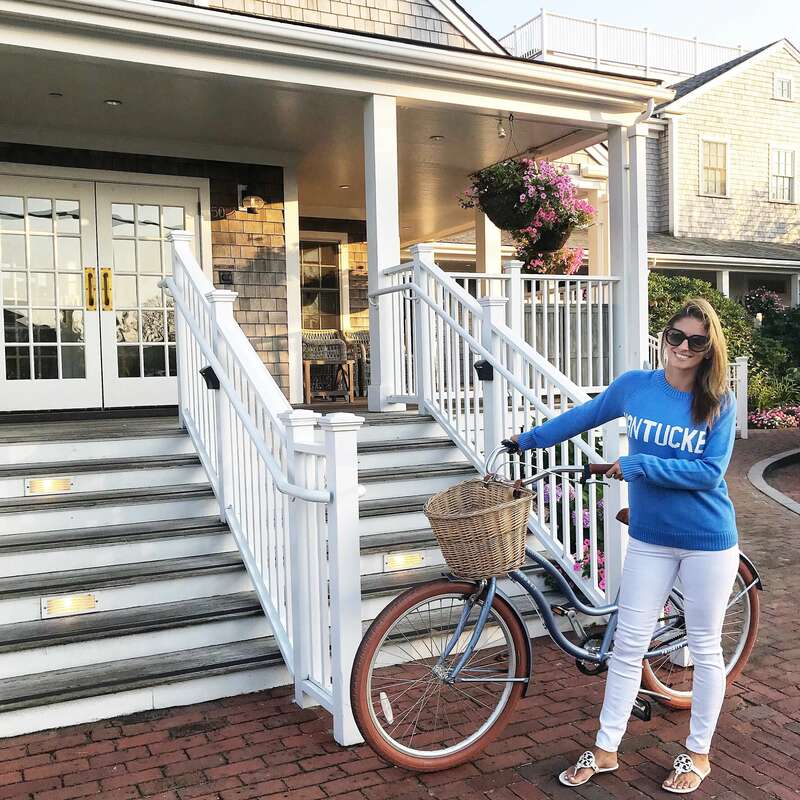 Free bike rentals (how can you not visit Nantucket without riding around on a bike with a wicker basket?) with plenty of bikes available, and outside they provided fresh towels for the beach and bottles of water. 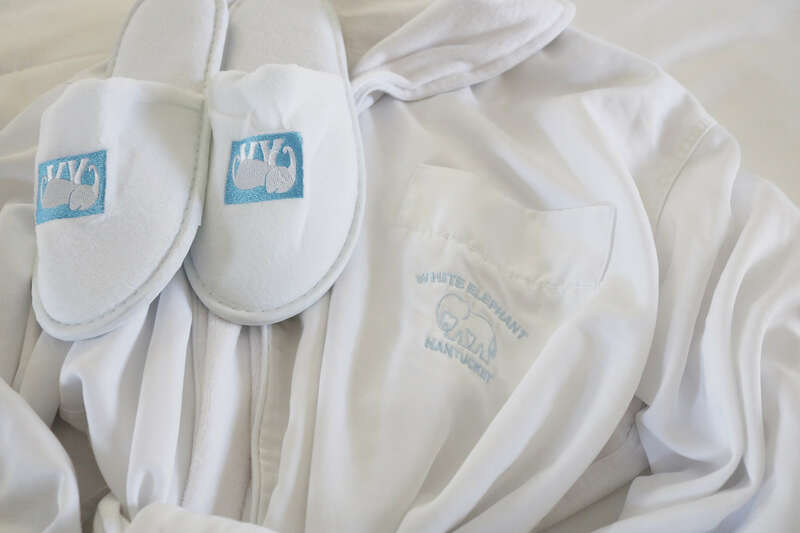 Here’s what really impressed me – the amenities for kids. 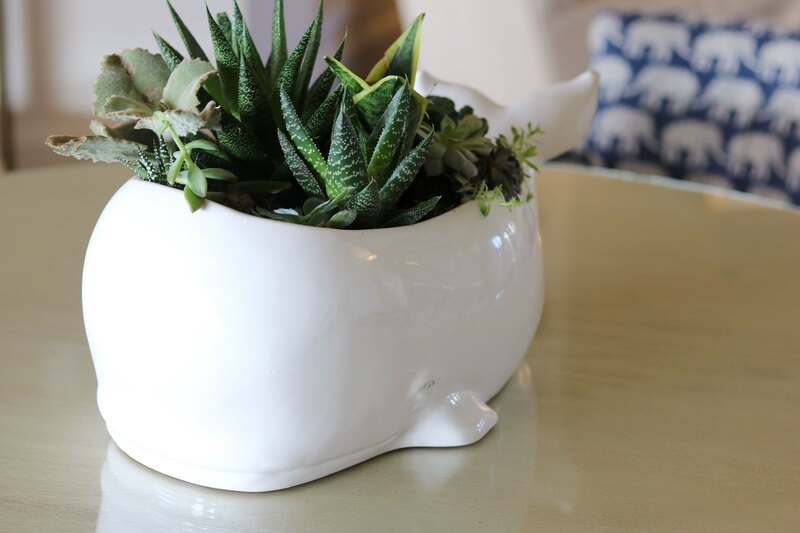 This hotel not only welcomes children, but goes the extra step to make them feel special. 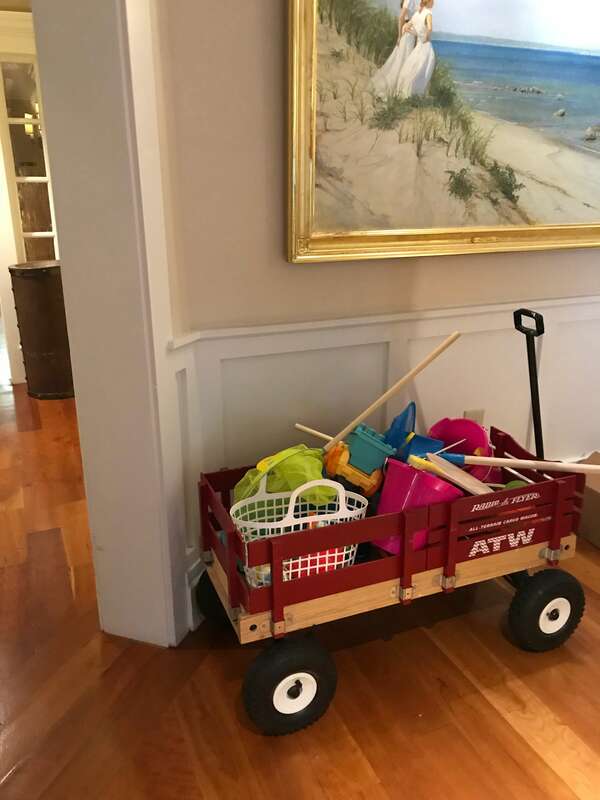 There was not only a wagon in the lobby full of beach toys for children to use, but there were also wagons available for children so you could wheel them around town or to the beach. 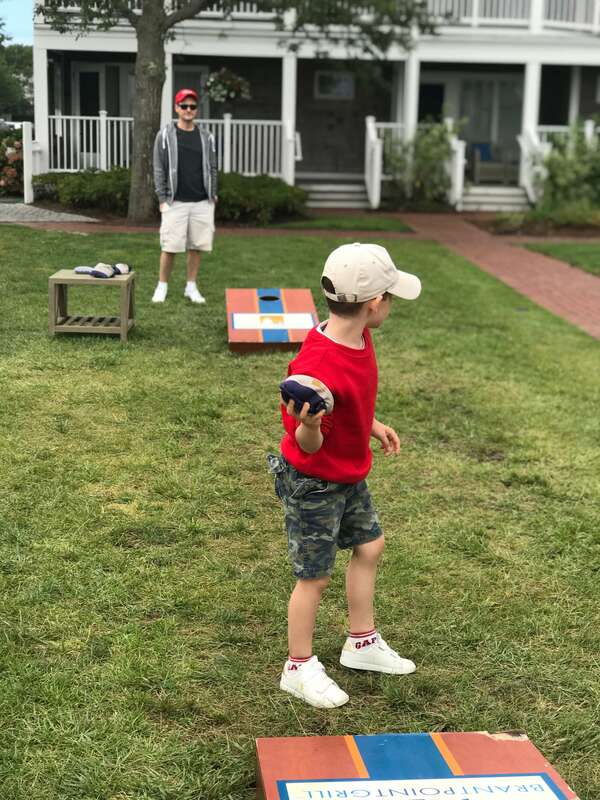 The hotel provided a sheet upon check in describing activities happening on the island for children (so helpful -it’s updated weekly), and the Brant Point Grill was more than what you would classify as just kid friendly. 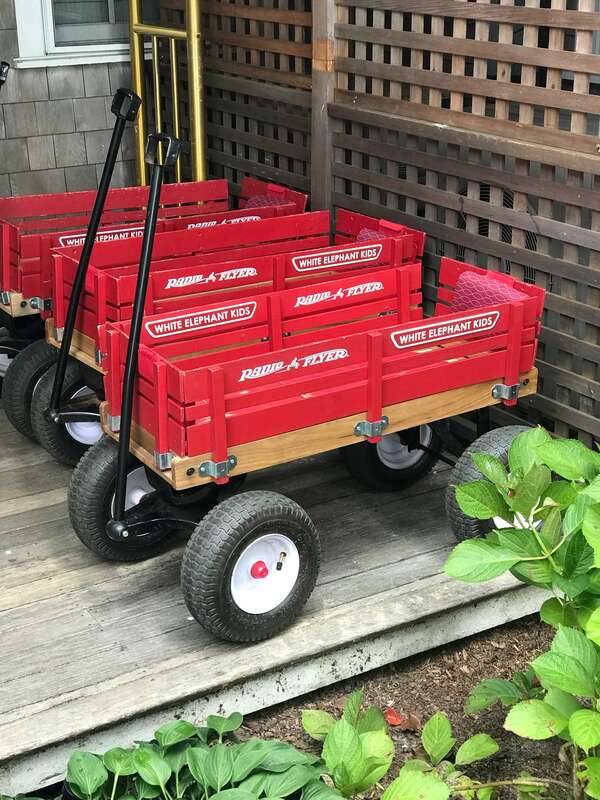 They offered special kids’ menus, sippy cups, and their Sunday brunch boasted a kids corner with things like chicken tenders, pizza, PBJs and an old fashioned ice cream cart! They also gave out postcards at the front desk and offered to mail them out. Our son took advantage and sent one off. 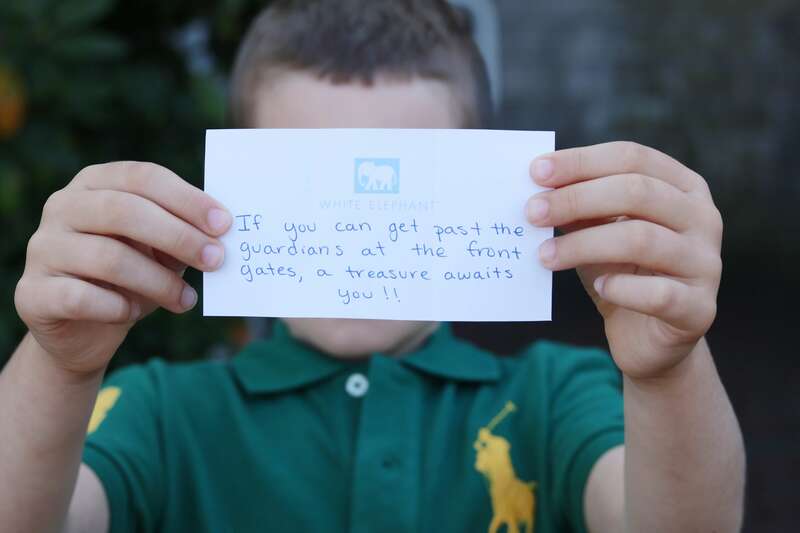 One of the things we really loved was the treasure hunt they had for kids! 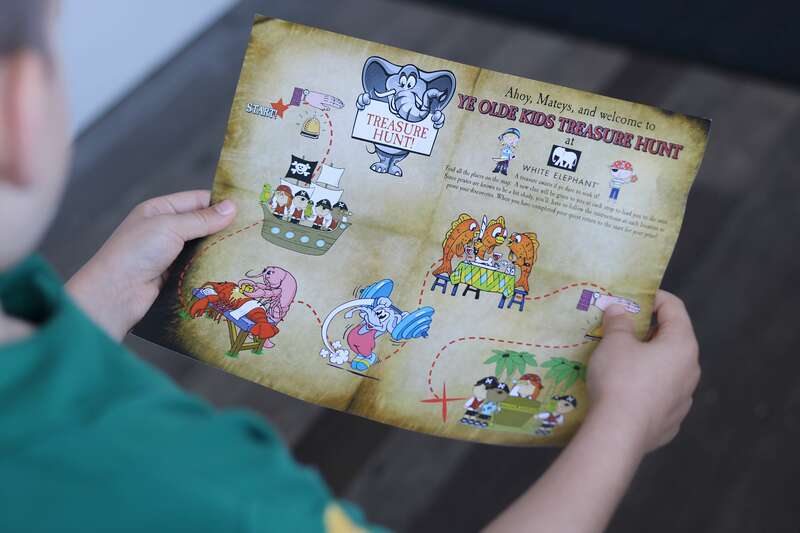 It started at the front desk, and we were provided a treasure map with clues posted around the hotel. 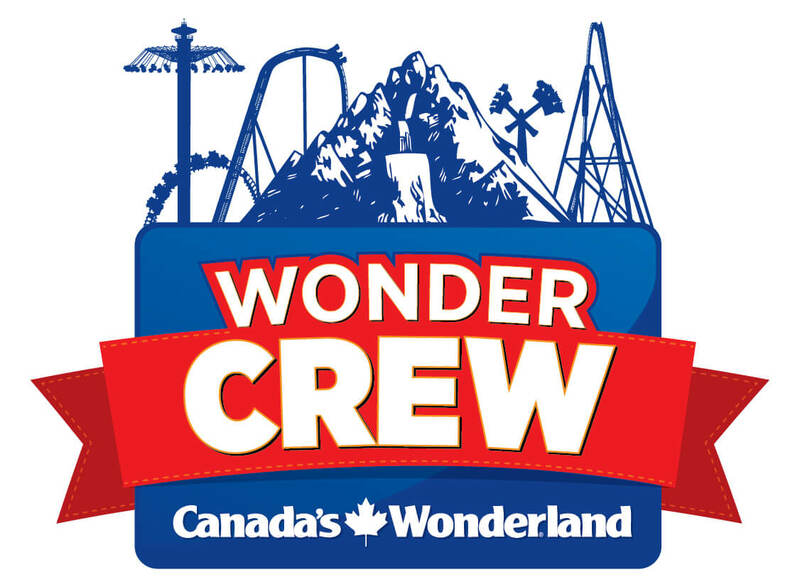 Our son absolutely LOVED this, and it was a great way to get familiar with the hotel! 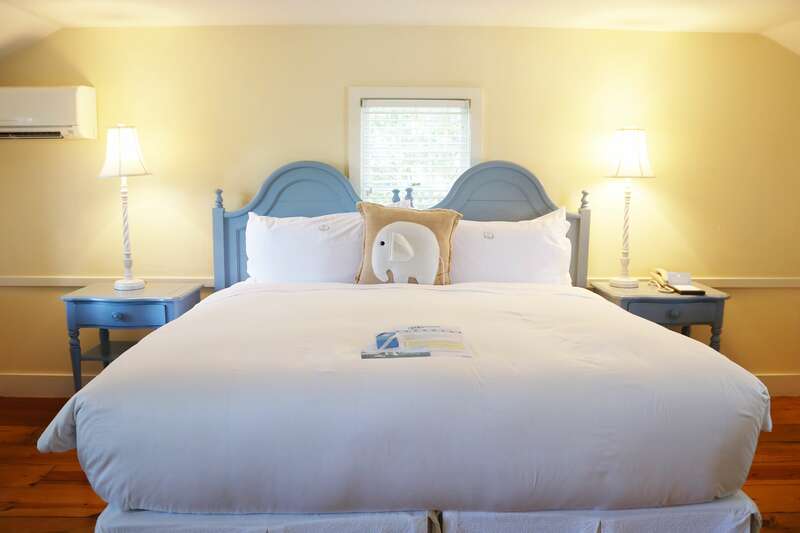 If you are looking for a relaxing stay close to downtown in Nantucket this is absolutely the place for you. 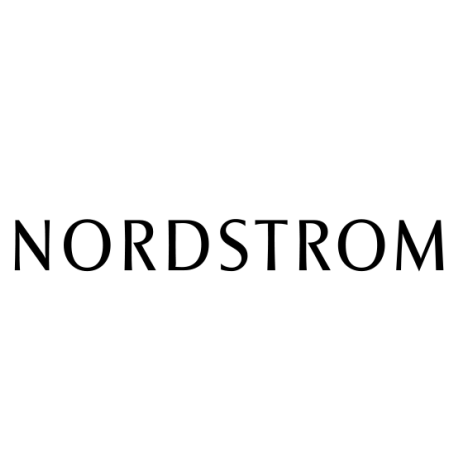 We were only a couple minutes away from all of the shops and restaurants – it was the perfect location. 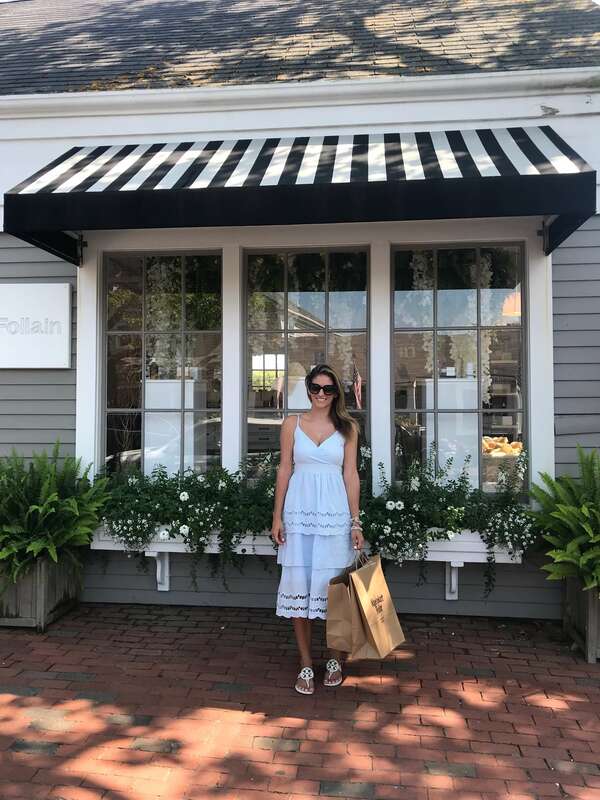 My favourite shops in Nantucket? 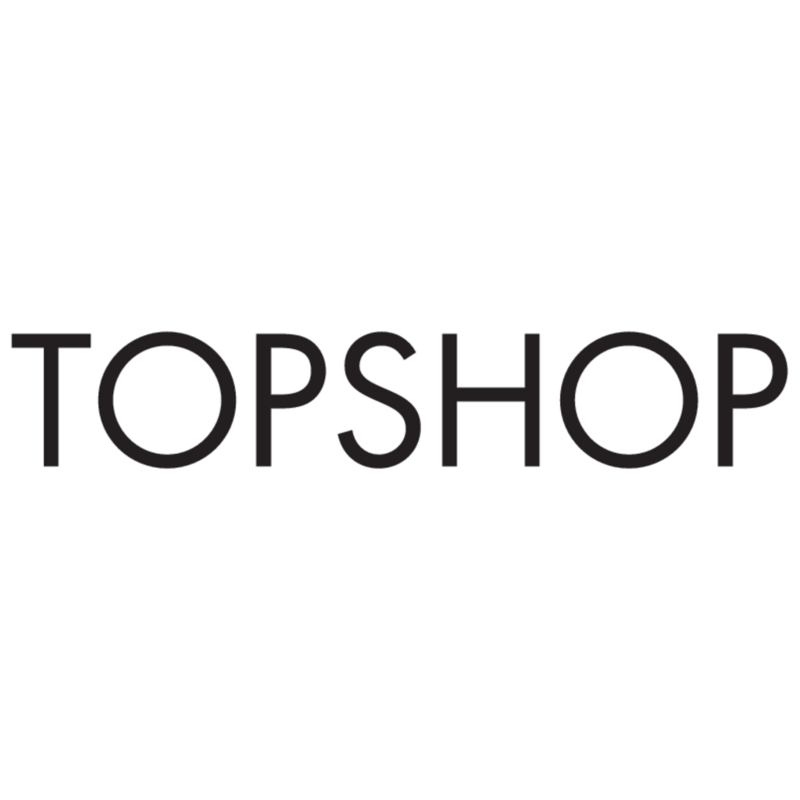 The Skinny Dip, Beauty Counter, CJ Laing, and Townpool. We ate lunch at Provisions which was SO good – we took our sandwiches to go and ate them on a bench outside of the store (it was CRAZY busy inside). We should have shared – the portions were huge! We also had a relaxing lunch at The Tavern at Harbor Square while we people watched while eating. 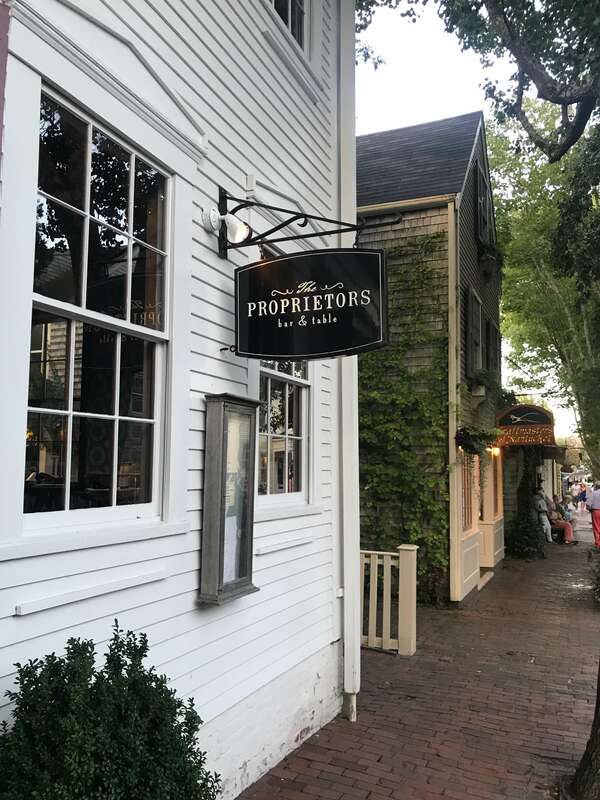 Our dinner at The Proprietors Bar and Table was the best of our trip. Incredible food! The restaurant was completely booked the night we went so I would recomend reservations. We did find seats – dinner was amazing. There was not a kids menu, but we made it through with a basket of bread and bits of our meals. I loved that we could stop back into our hotel for a break at any time because of it’s proximity to town, and also that we could spend so much time just hanging out at the hotel – it was a relaxing spot and we loved hanging out on the lawn. Nantucket was an amazing place to visit, and we have already started to talk about when we are going to head back! Thank you to Booking.com for helping us choose this hotel and providing us with our stay! 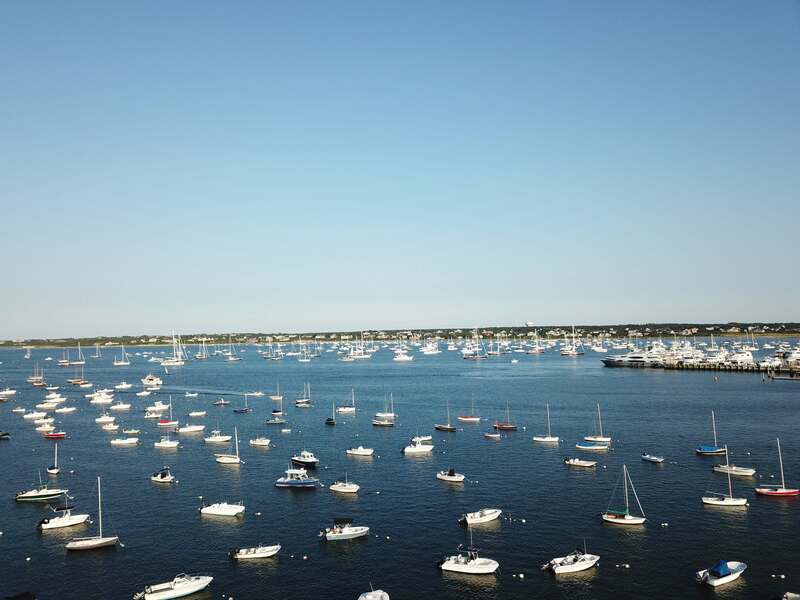 Next we were off to Martha’s Vineyard – my blog post on our stay will be up next week. 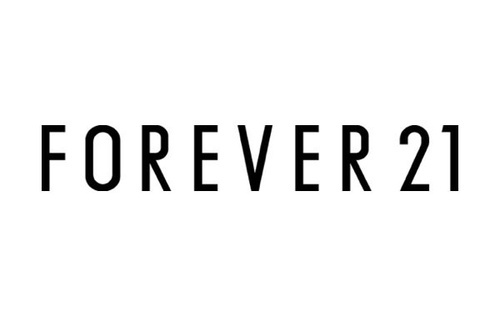 Very soon I will also have a video up of our whole Massachusetts trip – stay tuned see our whole adventure very soon!